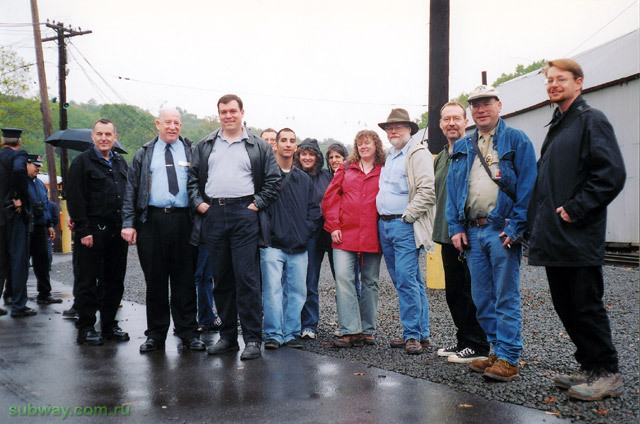 The first Subtalk Day at the Shoreline Trolley Museum was held on Sunday, October 13, 2002. A fairly large group of regular Subtalk posters attended on what was for the most part a gray, dreary, drizzly day. R-9 1689, specially chartered for the day, was the main attraction. TARS 629 and Montreal’s 2001 carried museum visitors, with Johnstown Traction Company 357 and Connecticut Company 775 making one trip apiece. The charter was open specifically to those who were both museum members and contributors to its cost. The operating staff also contributed to the cost. The day began for most Subtalkers with breakfast at the Twin Pines diner not far from the museum. From there it was off to the Sprague Building, where we parked and went inside. The staff members and operators changed into their uniforms while the rest of us either took in the subway interlocking signal in the lobby or filled out membership paperwork. Once all was ready, we walked along the track to the barn area, where the first order of business was to rouse 1689 from its peaceful slumber. The car looked terrific! 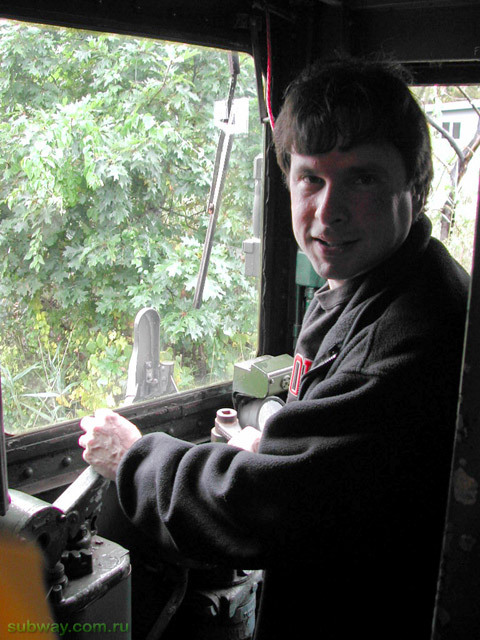 After Lou (from Brooklyn) Levinson, our expert instructor for the day, raised its trolley pole, Kevin McAleavey aka Selkirk TMO, who once operated the R-1/9s as a motorman on the IND D line, went through his favorite motorman’s ritual of flipping switches and circuit breakers. Slowly 1689 came to life as its lights, fans, and compressor kicked on. While waiting for the car to charge up, Kevin also took the time to answer questions about the R-1/9s in general. 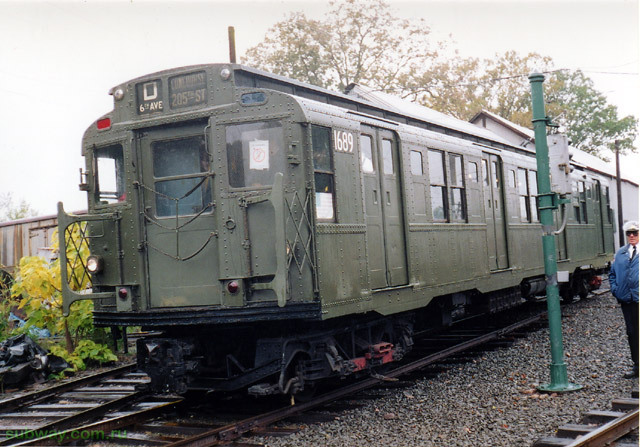 The last step was to set the marker lights on the end facing the barn door to green-green, the proper combination for a D train running express in the Bronx. Meanwhile, R-17 6688 was brought out of its barn with Kevin’s wife, Nancy aka Bingbong, at the controls under Lou’s watchful eye. Unlike 1689, 6688 was not chartered; it was brought out so that we Subtalkers could have a closer look at it. Once 6688 was parked, Lou and Nancy joined us aboard 1689, which by then was all charged up and ready to roll. Lou slowly nudged the 42-ton car out of the barn toward the reverse loop track. After we passed the barn spur switch, we reversed direction. 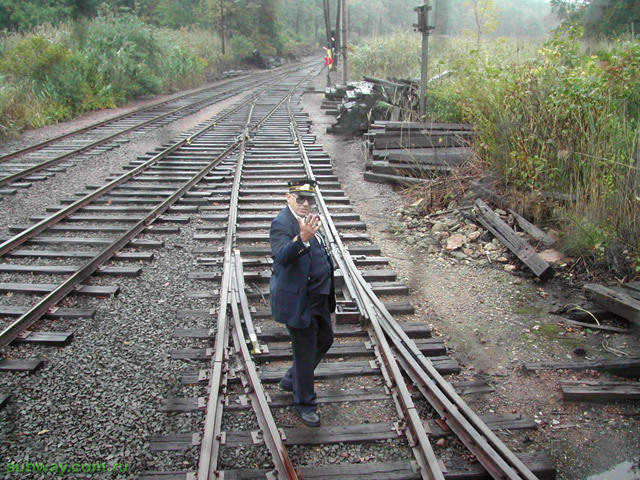 Nancy threw the switch and Kevin took over the controls at the other end of the car, piloting it down the mainline past Narrangansett Siding. Once again we reversed direction, and after the switch to the the high-level loading platform was thrown, Lou brought the car to a stop at the platform. It’s a station setup named Avenue L, so named after a former station on the Canarsie line which no longer exists. We waited for our turn to proceed onto the mainline and once we got the go-ahead from dispatcher John “Sparky” Sikorski, we were on our way with Lou at the controls. It was great to hear those all-too-familiar sounds again: the moaning, groaning spur-cut bull and pinion gears, the throbbing compressor, the snarl and hiss along with the accompanying “tch-ssss” magnet valve sound as the brakes were applied, and the sounds of the doors as they opened and closed. 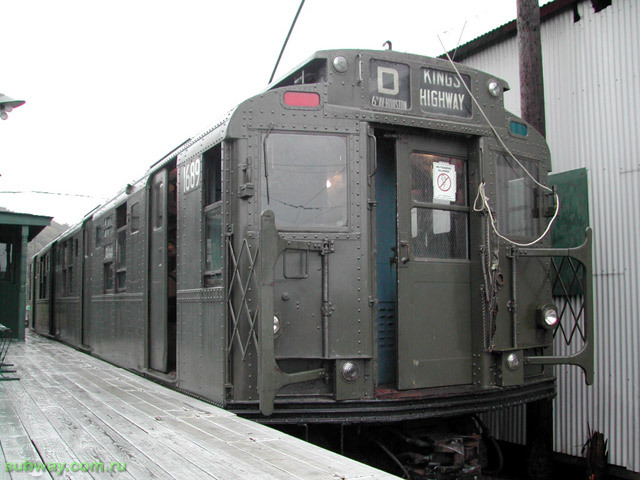 For this author, it was a trip back in time to when these cars still carried revenue passengers in New York on the IND and in later years, the BMT’s Eastern Division. We returned to Avenue L, and because we had to wait while a streetcar carrying paying guests made a round trip, most of us walked over to 6688. We boarded through one of the storm doors via a portable wooden stairway. Inside, the car looked great. The cab doors were open, and it afforded an opportunity to check out the breakers and especially the lever-style door controls up close. 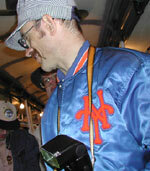 Thurston (Mr. R T) Clark produced a door key, and those of us who wanted to work the doors had a chance to do so. Then it was time for a group picture (one of many taken that day), and some who had cameras had a chance to put the self timer feature to use for the first time! Because of the rain and drizzle, 6688 was put away shortly afterwards because it was in the process of being repainted and had only a coat of primer. The noon hour had arrived and some went to get lunch while others went for a ride on one of the streetcars. 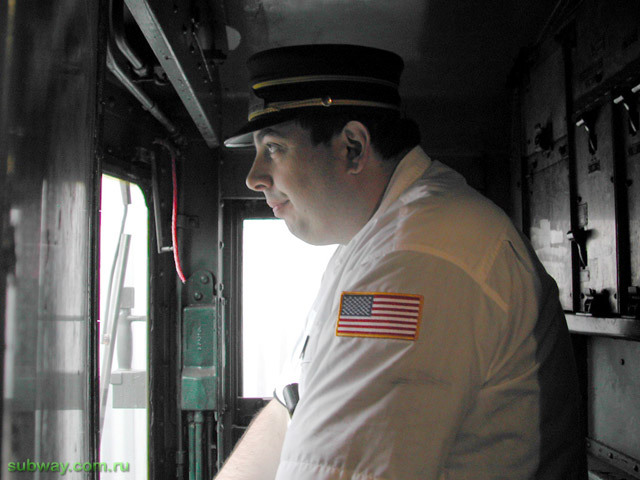 A few of us rode on TARS (Third Avenue Railway System) 629, operated by Chris Leverett aka Anon_e_mouse. 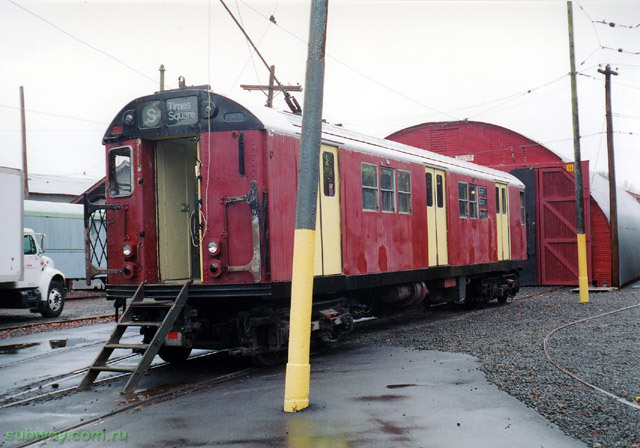 Several people got a rare glimpse at the Mineola, August Belmont’s private subway parlor car which at this time needs major restoration and is not normally accessible by the general public. By this time, the mainline was ours once again, and we reboarded 1689. Now the fun part began: handle time! This was an exclusive privilege offered to museum members of regular or higher category of membership. Because of the high turnout, handle time was limited to either an outbound or an inbound run. Eventually, handle time was rationed to quarter-runs; i. e., two people per outbound or inbound run. Even the streetcar operators had some handle time. This went on all afternoon under Lou’s supervision between streetcar runs. All in all, 1689 made a total of nine round trips – more than on any other day it was operated. Kudos to Lou for his limitless patience and expert instruction! Handle time went like this: hold the controller down while in the coast position with your right hand and move the reverse key forward with your left hand. At this point the side destination signs illuminate. Now without letting up on the controller, hold the handle down with your left hand and release the brakes with your right hand. Check to make sure you have a clear track and give two toots on the whistle. Move the controller to switching (first point) and as the car picks up speed, peg it up to series (second point). Cut power before reaching the first curve and coast through it. Reapply power after clearing the curve and cut it once again before the insulating block. Listen for the click, then reapply power once again. Now we're on the straightaway headed directly for Narrangansett Siding. Peg it up to parallel (third point) and feel the car accelerate. Keep an eye out for anyone or anything near the track at all times. Take a reduction as you approach the switch. Lap. Repeat as needed to bring the car to a full stop. Once the switch is set for diverging, move the controller to switching and once the car gets moving, cut power and coast to the platform, applying the brakes as before for a (hopefully) perfect alignment along Avenue L. Whew! The list of attendees reads like a who’s who on Subtalk: Steve Bulota aka Steve B 8AVEXP; Doug Diamond aka BMTman; Thurston aka Mr. rt; Chris Leverett aka Anon_e_mouse; Lou Levinson aka Lou from Brooklyn; John “Sparky” Sikorski aka John S., Harry Beck aka High St./Brooklyn Bridge, webmaster of www.nycrail.com featuring The Other Side of the Tracks; Kevin and Nancy McAleavey aka SelkirkTMO and bingbong; Jeff Rosen aka Sgt. Jeff; honorary Subtalker Joe Roth; Jeff H., resident technical expert par excellence; Bill Newkirk, whose subway calendar photos receive rave reviews; Subway Surf (Andee); Mike Fraser; David Cole; Larry Fendrick aka Notchit along with his girlfriend Marie (Notchette) and her daughter, Deanna; Piotr (Peter the Pole) Dzwonek aka NJCoastExp; Larry Redbird R-33, who possesses a wealth of NYC transit trivia; CI Peter aka On the Juice; Mike Pompili aka RIPTA42Hope Tunnel; Bob and Linda Andersen (Bob maintains www.lirrhistory.com), and Jeff Babbitt, who had handle time on 2001. Once the museum had closed to the public for the day, Subtalk Day participants were treated to a cake baked by Chris Leverett and served aboard 1689. As always, all good things come to an end, and after one last group picture which included the operators and dispatcher, it came time to put 1689 back in its barn and close up for the night. We made our way back to the Sprague Building, where museum staff personnel changed out of their uniforms. Then it was off to an Italian dinner for a dozen of us at Aniello’s Pizza located in Trolley Square near the museum before going our separate ways. The consensus opinion was that a good time was had by all and that this event should be continued in the future. A special thanks also to Sparky for keeping things going smoothly and efficiently all day long from his dispatcher’s post. A tip of the hat also goes to Eddie Sarkauskas, who spearheaded Shoreline’s acquisition of 1689 back in 1977.